Kevin: Hey everybody. Thanks for tuning into Eight Questions and I am Kevin Tumlinson. I’m happy to be here and I’m actually really thrilled to be talking to my good friend, Nick Thacker. He’s a thriller author in the vein of James Rollins and Dan Brown. And he’s been invited to write books in shared universes for authors like A.G. Riddle, who wrote The Atlantis Gene. And in addition to his books, Nick is the co-host of a very popular Self Publishing Answers podcast with yours truly and Justin Sloan. Nick, man, how you doing? Nick: Doing well. That was a good intro. I liked that intro. Kevin: Thanks man. I’m a writer and I do this sort of thing. So you and I know each other really well. I’m not going to try and fool anybody about that. Nick: We’ve met twice and we know each other really well. Kevin: We literally have met twice in person, that’s sad. We’ve known each other for about two years now I think? Nick: Yes, it’s got to be closer to three I think. Kevin: Yes, and we’ve done a lot of work together, including some co-authoring. We’ve written at least two books together. Kevin: A third will be on the way, I promise. But Nick, so you write primarily thrillers, right? Kevin: That’s not one of the Eight Questions. I’m just clarifying. Nick: Oh, man, it’s going to be a lot easier than I thought. Kevin: This is going to be easy, yes. Your primarily a thriller writer so that’s probably what you’re best known for, right? Nick: Those are the ones that are doing the wellest. Kevin: The wellest. You’re an author so that means that’s a real word. Nick: It’s real now. There’s definitely a sci-fi slant to it. Like you said Dan Brown and James Rollins, where the emphasis is on the thriller part, but there’s some science fiction. It’s like oh, what it in there. Love that. That’s the whole conspiracy part of it that I like to write. But I also have some straight-up science fiction. Not hard science fiction, but definitely in that genre, in the vein of science fiction stuff. Kevin: And he’s good at it. But enough ego stroking. Let’s get to the questions because I’m actually kind of excited to hear your answers to some of these. So let’s see how this goes. Nick: I’m excited to hear what I say. Kevin: Yes, me too. We’ll surprise ourselves. All right. So first question, so what does your writing routine look like? Nick: Oh, good one to start with. This is funny because I know what your writing routine is and I always feel try to live up to your standards. Kevin: No, no, there’s none of that, there’s none of that. Nick: It’s really interesting. I try to write and that’s basically where I am right now in my life. I mentioned this last week at the conference we were at and I think it’s definitely going to be true for me for this season. My writing routine is weekly, not daily right now. I’m trying to hit a word count where I’m hitting about 5,000 – 7,000 words a week, which is admittedly pretty low for what I’ve done in the past. But when I’m actually going to write, my routine is pretty straight forward. I am a physical location type writer, meaning I have to be kind of in a physical space that works. There are numerous spaces that could work but I have to be separated. I can’t have a TV on in the background, none of the background noise kind of stuff other than Starbucks and people milling about. Kevin: Yes, I find it a little ironic that you can’t work with TV and that sort of thing on, but you’ll work at Starbucks. Nick: Right, well, because it’s different. If there’s a TV on, I’m watching it with something that can engage me in. There’s people in the background, they’re not talking to me or trying to get my attention is the big difference. But I don’t write in silence. Typically I’ll have music on or something in the background. So the Starbucks thing is basically the same concept. That gets me in the headspace as well. And once I’m in there it usually takes me about ten minutes or so to get in the zone of really working. And I use the Pomodoro technique. I actually have a little timer on my phone and my computer which is just a set amount of time. For me it’s twenty-five minutes of writing, five minute break. You do that three or four times and then take a longer fifteen minute break. Kevin: So that’s kind of your writing spring. Kevin: Yes, okay. You and I, we both like to work at Starbucks and that sort of thing. I probably have gotten a lot more used to working at home than I ever thought I would. I don’t range out as much as I used to but I do kind of miss Starbucks. Nick: Yes, and people have their moral feelings about Starbucks. Kevin: Yes. Some people do apparently, as emails will attest. Kevin: And then you and I worked together at a really cool coffee shop in Mount Pleasant, Joe’s. Nick: Yes, and I say Starbucks to mean places like that. Nick: It’s the vibe that’s really important. I don’t care about the brand of coffee that it is. I prefer the local type stuff anyway. So we lucked out with Joe’s. But if you’re ever in Mount Pleasant, Texas listeners, hit up Joe’s Coffee Shop. Kevin: I think it’s Joe’s Café. It’s pretty awesome place. Nick: You don’t have a choice. That’s probably the only place that’ll be open. Kevin: Yes, I’m going to try and get that guy to transplant that into my area. So let’s go to the next question. So what’s the most effective marketing tool you’ve found? Nick: Build a mailing list and keep interacting people who like what you have to offer. Kevin: Really? I expected something different. Kevin: Yes. I kind of pre-wrote in my head the answer you were going to give, and that was not it. I mean yes, I agree with you the mailing list is very important. But I really thought you’d say something else. Nick: What did you think I was going to say, BookBub? Kevin: No. I actually thought you were going to go with Facebook ads. Nick: Oh, see I consider that advertising and I think that’s all part of marketing, but if you don’t have access to funds for Facebook ads, and you don’t have access to funds for a BookBub ad or you don’t get selected, there’s not much you can do other than build a mailing list. So that’s kind of the default go-to for me. It’s not new and it’s certainly not a novelty to anyone listening or reading the transcript of this. It’s just something that works and I think always will. And it’s really not specific to – I don’t care if it’s an email address or a mailing address or whatever. You have to have some way to interact with people that have already expressed interest in what you have as well as having given you permission to interact with them. And that’s how a mailing list is so powerful. For what it’s worth, I build a mailing list through things like Facebook ads and BookBub ads anyway, so it’s all sort of related in that whole world. Kevin: Yes, and like you said it’s not new. Everyone tells you that. I struggled for a long time on building my mailing list. Do you have tips for people who are just starting? Nick: Oh, yes, I did too. I struggled with it as well. It’s one of the things that you – it’s sort of the spaghetti approach. It just has to be. You try a bunch of stuff and see what sticks. And if you’re like me, and probably like you, you try the spaghetti method over and over again because nothing sticks. The first thing that really worked for me was in the non-fiction realm was guest posting and just writing on other people’s blogs and asking people to head over my way and then enticing them with some kind of freebie offer. What works really well now, 2016, is Facebook ads, getting people to sign up for your mailing list by giving away a book or three for free. They’ll sign up for that. And then there’s little tips here and there. You can do things like ad links to your Amazon book description page. This may be against their terms of service but I do it all the time and they haven’t nixed me yet. So I basically just say hey, if you want some free books, head over, type this in your browser and you’ll get the free books. And it seems to work pretty well. Kevin: I haven’t been brave enough to try that yet. I’m going to but I have this fear like I’ll do it and I’ll be the one user who gets busted. Nick: You’ll be the first one, exactly. I’m still kind of afraid of that so I don’t do it all the time. But if I have a big BookBub advertisement or something going out, a big promotion, I’ll usually try to add that in there and get however many people I can. Kevin: So you don’t permanently leave that. You put it in there while it’s on like a free promotion or something like that? Nick: It’s never permanent on purpose. I always put it up there and forget to take it down. Kevin: Which most of our marketing efforts, it’s just an accidental – it just stayed that way until it worked. Nick: Yes. This morning I think I had just removed it from one of my book description pages, but it’ll go back up whenever I do another promotion hopefully soon and stay until I remove it, hopefully soon after that. Kevin: So do you see a lot of traction from that? Nick: I do, I do. I’m not tracking it. Kevin: How do you know then? Nick: That’s what I was just going to say. I’m not tracking it directly so it’s impossible to know how much exactly. But the example that I use is BookBub where I purchase a BookBub advertisement, my book is sent out to their list and the only way they get on my mailing list from that BookBub ad is by going to Amazon, seeing my little note that they can get free books by signing up, and then seeing the bump in sign-ups after that. So for example, the way to test it is to stop your Facebook ads, if you had them running, stop every other incentive you have on your web site and just keep the one on Amazon that leaks back to your personal page. And then you write your BookBub ad and you can tell how many people sign up from it directly. Kevin: I guess you can also create like a unique URL on your web site. Nick: Yes. The only reason I didn’t do that is I wanted – it’s not an actual clickable link on Amazon. That’s worth noting. Nick: Maybe if you were to try it, maybe how they would find out I guess, I don’t know if it would signal or put up a red flag in their system. But it’s just text. It just says literally www.nickthacker.com/free-books and that’s what they have to copy and paste into their browser and then press enter to get there. So the longer that is, the easier it is to lose people. I don’t want to type in ?= or whatever. Kevin: But if you had a page like that, free-books, and that was the only thing leading to it then you would know. Nick: Yes, and I’m lazy so all my stuff goes. Kevin: Everything goes to the same page. Nick: But again, at the end of the day it’s not really as important to know where they’re coming from as much as that they’re getting on the list and engaging with my stuff. I know that other authors may disagree with that statement, that’s fine, but for me building a list is far more important than knowing how to build a list, if that makes sense. Kevin: No, that works for you and you’re doing well at this so it’s not like anyone can fault you for what you’re doing. You’re doing it right, for you. Nick: There’s always a better way to track stuff is what I’ve learned. Kevin: Yes, that’s true, but there always will be. This is not the next question but it’s related to the current question. So do you track anything? What do you do to kind of monitor and adjust your marketing? Nick: I am a firm believer that the Amazon affiliate system is broken and flawed. So my brief stint in tracking exactly where my sales came from, one of the only ways to do that – first of all I’m exclusive to Amazon so when I say selling books, it’s literally just Amazon. Because I’m exclusive I can’t even sell those books on my own web site. So the only sales I get are on Amazon’s platform. Whether that’s paperback, hard cover, they own Audible anyway, so everything is Amazon. So to track Amazon stuff you need a tracking link and a tracking code, and the best way to do that is through affiliate links because Amazon’s associate program, that’s their affiliate program, allows you to put tags and links out in the world and they tell you how many sales were generated from that link. Nick: Yes. That is usually 50% accurate most of the time. So it’s really hard to tell. I’ve tried tracking that way and I’ve gone to the extent of setting up in my WordPress web site I use a plugin called Pretty Links, and it does exactly what it sounds like it would, it makes your links pretty. And I’ve set up these Pretty Links to be kind of masked URL links to specific Amazon tracking codes and all that, and it’s again only as accurate as Amazon associates program allows it to be, which I don’t think is very accurate. So I’ve kind of given in, thrown in the towel on specifically trying to track how many sales are generated. What has worked for me is looking at ROI month over month, or X time over X time. I know that I did really well in audio books the last three months progressively, and I’m trying to figure out how to make that continue, that trend. Nick: And I have my ideas on it. I think I had two BookBubs at the beginning of the year for two different books that really generated and jump-started a lot of audio book sales. So there’s not a whole lot, again, that I can control because it’s up to BookBub whether they accept it or not. Nick: But that’s the kind of stuff that I think tracking is really important. If we start getting really analytical and data-centric and granular about the focus, we kind of lose as authors because we’re not writing. But we have to do something. And I think that something is just taking a birds eye view, even if it’s month over month, what did I do last month that worked, what did I do last month that didn’t work. And here’s the numbers that show I made this many sales. We have that information. We just don’t always know exactly where those sales came from. Kevin: Right. Which is kind of sad. Kevin: It is sad, yes. We should know that. Nick: Exactly. I think Amazon will improve as we go forward. They know a ton about us already. Nick: As buyers and authors. Kevin: They just don’t know how much they should share with anybody. Nick: They don’t want to go the Facebook route and run into privacy issues. But that’s where I think their platform is headed. Being able to tell us generally what the demographics are of our buyers. Kevin: So where does podcasting fit in with your whole business plan? Nick: That’s a hard question because most of the time it doesn’t. Most of the time it’s not the number one thing that’s going to help me as an author. But it’s still a good thing. So I’m really challenged by where that fits in and what priority to give that. But the part that’s not challenging is deciding that it’s not the number one most important thing that I do. I love doing podcasts and I do think that they’re beneficial to my career and anyone who does a podcast. It can be very beneficial but I still don’t think it’s ever going to be as beneficial as writing the next book. And Kevin, you know this story better than anyone, but I’ve tried to downsize a lot of my professional life. In the past year we had a kid, and we’re about to have another one. There’s just all kinds of reasons for that. And of course the one thing I wasn’t going to give up was writing books. So my world shrank and I think it helped me really clarify hey, I’m going to do this writing thing no matter what. And then as we kind of go forward, season by season, we’ll see how this other stuff fits in, like keeping up a blog and then that all kind of fits into that category. Kevin: Yes, you and I, we had lots of big plans to the end of about 2015 and we both sort of – I don’t know, at around the same time we kind of both hit that wall and decided it was time to downsize a little. Which I think benefited us more in the end. Nick: I know that it did. I feel very satisfied at the end of every day, end of every week that I’ve gotten a lot more done than I did before when I was trying to do all this other stuff. Nick: It’s kind of ironic too because I typically would do more stuff than I’m doing now, but hey, if I get that 5,000 or 7,000 words at the end of the week, I’m like yes, that book’s on the way. That book’s coming. That’s something else I can add to my portfolio. And I think I’m pretty sure I can speak for you when I say that we are really excited about all the stuff we could be doing. Nick: And so we get caught up in that and we chose those rabbit holes. And sometimes they’re even potentially profitable rabbit holes that are just not going to help us get closer to the mountain as you and Neil Gaiman like to say. Kevin: I think it’s like a cosmic rule now that that quote ends up in every single broadcast I do. Nick: It has to be. Kevin: It has to be. It’s in my contract. Nick: Nobody dies by getting shot or stabbed in the neck at the end. Kevin: At the end of every Nick Thacker book. Kevin: Spoiler alert. That’s the title of Nick’s next book by the way, Spoiler Alert. It starts with the antagonist being stabbed in the neck. Just to get it out of the way. So what is your most important daily habit? Nick: Wow, my most important daily habit. Kevin: It doesn’t have to be writing by the way. You can talk about anything. Nick: It’s definitely not because again I’m not doing that daily. I wish I was. I wish I was at the point where I could make that commitment. My most important daily habit has got to be stopping and reflecting on my day. I’m trying to do this in the morning, I’m trying to set up the morning ritual and do all that stuff, but a one year old that doesn’t sleep at night typically changes that everyday, so. I know I use her as an excuse all the time but if she would just be better at life then I wouldn’t have to make that excuse. But to stop and reflect that I have a one year old, that I have a family and that I’m able to write. That we have jobs and our life is good. That right there is enough ammunition to get you through just the hardest day, or should be. And so that’s one of the things that I’ve really been proud of myself for over the last six months or so, since I’ve started trying to keep a daily journal and just write down my thoughts and kind of process some of the things that are happening. Because inevitably I’ll go into this thoughts and musings mode where I’m reflecting on the good that’s happening in my life every single day, and that’s a really good habit to be in. Kevin: I agree, man. What do you see coming out of that as you do that more often? Nick: My mind set has shifted in a really good way. My mind set is now man, I can do anything I want because life is good. Rather than: life is good, I don't have to do anything. The mind set shift of well, no, life is good right now. I don’t need to make any changes because I don’t want to mess this up. And there’s value to that and being man of the house and wanting to security and all that. But again there’s a lot more value in jumping into some of that risk of I could write this book, or I could work with that person, or I could do this. Wow, imagine what could happen. Imagine what could come out of that. So you start to dream, you start to think and you get really motivated and then I start writing so. People get shot in the neck and all that, at least I’m writing. Kevin: But at least it’s a thriller. Nick: At least it’s a thriller. Kevin: Okay. Side question, what defines a thriller for Nick Thacker? Nick: We kind of touched on this a little bit. For me, again, thriller is a huge genre. It’s like trying to define romance. But if you’re asking what a thriller – what mine are, or what I want mine to be? Nick: It’s this hint of conspiracy theory or like the science fiction what-if kind of question. What if we could live under the ocean and be fully sustainable, fully functional society? That’s The Depths. That’s the premise behind that book. Or what if there was this ancient code that is kind of wrapped up in all these different monuments and things around the world? And a lot of authors have done that type of thing, but the thing that I really like about the difference between that and science fiction, which is just taking that to its logical conclusion and everything is futuristic in some ways or not quite the world that we live in now, is that I have to take that thread and put it in the world that we live in now. What if the bad guy had access to a rocket that could travel ten times the speed of light? I don’t know, I’m making stuff up now. But that’s one thing and that’s a science fiction premise, but then how do you make that accurate in today’s world and maybe DARPA is working on something that does just that. Nick: And I like that. I like to have that all kind of in there. I’m not answering the question very well so I’ll say it this way. Your thread that is pretty out there, science fiction wise that well, yes we’re years away from that. And then trying to craft a story that is non-stop action, that ends with the realization that oh, wow, this is happening and this is what it looks like, and this is the potential fall out from that or outcome from that. Kevin: Yes. Okay. I can live with that as a general definition of thriller. Kevin: All right. As we asked the important daily habit question. Now I want to know what is your worst daily habit? Nick: My worst daily habit is pretty simple. I go to bed too early. Nick: I think I need way too much sleep. Kevin: I don’t think that that’s a bad daily habit, but go ahead. Nick: No, I’m talking like 7:00 yes, it’s about time to go to bed now. But then I’m not really getting up super early either. If my daughter gets up at 5:00, I’m up and I’m with her so it doesn’t really count as hours I get to work. So I’m not really getting that chunk of dedicated time that I want. That’s killing me. Kevin: But you have like a toddler and a pregnant wife. I think this could be a temporary situation for you. Nick: That’s right. I’m really hoping so, absolutely. Once we kind of get back into the regular world of stuff. But everybody I’ve talked to that’s got kids is telling me that it never ends. You’ll be 50 years old and your kids are going to move out before you have time to yourself again. Other authors have done this before, so I think I can make it happen. Kevin: So who are your biggest influences and why? Nick: I’m going to have to say Kevin Tumlinson. Nick: I knew you were going to say that. Nick: It serves you right. You're writing every day in your blog. You’re publishing them, you’re getting traction. You’re doing what I want to be doing, right. Kevin: This is not promote Kevin time though. Nick: Just shut up and deal with it, because it’s true. And when you think about it, you’re inspiring me to write better and more because you write like freakishly good stuff and you’re doing it way more often than I ever thought was humanly possible. Kevin: All right, I appreciate that. But who are your real influences? Nick: You’re putting it out there and it’s published and there’s that. But it happens to also be amazing so anyway, yes, it’s just inspirational for anyone. Kevin: Thank you, I appreciate that. So who’s another influence then? Nick: Influences are easy. I’ve got a lot of guys that I’m essentially trying to copy. James Rollins and Dan Brown are the two that you mentioned that come to mind for me. I started writing because of Dan Brown. I read The Da Vinici Code in high school. I kind of rediscovered my love of reading. I was like wow, I didn’t know there were books that were actually engaging and fun to read and so I fell down the rabbit hole of his books and then branched out to other people. Found James Rollins. He’s my favorite author right now of all time. I mean he’s just – everything he writes I consume. And in person he’s a good guy. So it’s just, yes, he’s definitely a major influence in my life. And then there’s a lot of authors that are similar to that, kind of all in that same thriller type action adventure genre that I could go on naming forever. But those are the two big guys. Nick: And there are a lot of guys that are influential for me just from the whole self publishing and indie author perspective. The big names that come to mind at the Hugh Howeys, the Mark Dawsons, the Joanna Penns. They’re the ones that are really making waves in indie publishing and it doesn’t matter that they’re in a slightly different genre or completely different genre than me that I’m able to follow and kind of copy what they’re doing and achieve my own little kind of success because of the groundwork that they’ve layed or the things they’ve figure out. Kevin: Yes. Okay. I’m on board with everyone you mentioned except me. So all right. Nick: You should be your own inspiration. Kevin: I should be my own inspiration. So if you could have one do-over, what would it be? Nick: What are we talking about, books? Kevin: Life, lifetime here, anything, man. What’s the biggest thing you’d go back and do better? Kevin: If you want to narrow it down to career, that’s fine, but it’s wide open. Kevin: You narrow it down on your own. Nick: One thing that I could do over. Yes, I have a hard time with that question too because I try not to regret stuff. I think you can learn from everything you do, even if you fail miserably. And that’s the point of failure, for one, but even situations that aren’t your fault or you don’t make a mistake but just happen to you, I think you can learn from those, and of course we want to erase those. Yes, my Granddad died and I never really got to hang out enough with him. I’d love a second shot at that as an adult. Like hanging out like adult to adult, you know. Nick: He was a huge inspiration for becoming a reader at a young age, as was his son, my Dad, and so just to be able to show him where I am as an author. I don’t want to get super heavy but that would be a big thing, that would be really important, or that is really important. If I could go back and do it over again. Kevin: Yes, man, I’m right there with you. Like my Grandmother put me through – she actually paid for me to go to the Writer’s Digest School. I think she was the first person to believe in me as a writer. So I would totally take that as a do-over. Nick: Yes, and the hard part about saying all that though as a do-over is I wrote my first book, The Golden Crystal, because he passed away and I felt compelled to give that to my Dad for Christmas. So I don’t want to really do it over, otherwise The Golden Crystal may not have ever come to fruition. I think there’s a lot. Every book I want to redo. Every book I want to do over. Everything that I publish. But I mentioned this before, the iterative publishing route that I’m trying to push out in to the world and what I’m trying to follow is exactly that. Like hey, there will be time, when I make time for it, to re-release The Golden Crystal. Edit it better, laid out better, better cover design. All that stuff can happen. Nick: Currently I need to get my name out there more and that means writing more books and better books. But we can iterate as we do it and we can get better and we can learn from those past mistakes so we don’t have to go back and do a full redo. Kevin: Yes, I agree with that. That’s cool. So the last question, not technically, but this is the last question on the list. Nick: I want to entertain people. Nick: With my books. I mean in life I hope that my legacy’s better than that, but if a reader comes and finds my book, I just want them to have a good time with it. I don’t strive for really deep complex thoughts in tackling the universe questions, yet. I’m not a good enough writer for that. I don’t know that I ever will be. I started writing and I started reading because I wanted to be entertained. It’s not different than going to a movie for me. I don’t want to go to a film festival movie that makes me thing too much, because I’m not there for that. I’m there to be entertained. Nick: And I think there’s people out there that are like that. And so I want to write those types of books. If there’s more to it than that, great, that’s awesome. But my legacy people pick up my book and they’re going to have a good time. They know they pick up a Nick Thacker novel and they’re going to be in for an adventure. That’s what I hope they end up being. Kevin: And I think you’re living up to that, man. Kevin: So where can people find out more about your work? Nick: I’d love for them to check out the web site, just my name, nickthacker.com. And I’m on Twitter, I don’t typically do a whole lot of tweeting but I’m definitely there. I’m definitely around. And that’s @nickthacker as well. And then find me on Facebook. I shouldn’t have to explain where that is. Nick: The Facebook. Just do a search. There’s not a whole lot of Nick Thackers out there, they’re not all authors either so it should be pretty easy to figure out which one’s me. Go find me on those and hit me up and say hi and go over to my web site and grab some free books if you want. Kevin: Perfect. 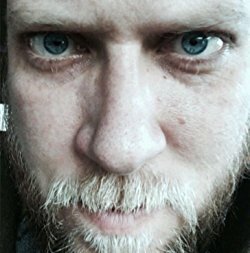 That was Eight Questions with Nick Thacker and if you want to find out more about me, and this is just my little plug at the end, but you can go to kevintumlinson.com. But definitely be sure to check out Nick Thacker’s website, nickthacker.com. Find him on Twitter, find him on Facebook. Nick, thanks so much for being on, man. I really appreciate it. Nick: Always a pleasure man, good talking to you.